For most organizations, once they reach a certain size or have a certain amount of complexity in their environment, the need for an identity management solution arises. 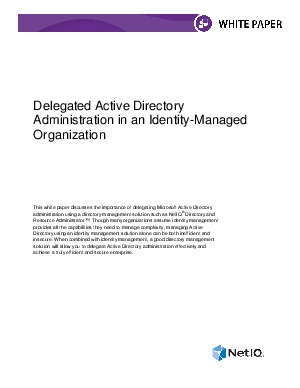 While the assumption is often that identity management provides everything they need to manage access rights to company resources, using an identity management solution alone can result in unnecessary and elevated administration rights in Active Directory. This free NetIQ white paper demonstrates that combining an identity management solution and a directory administration solution can help you to achieve a more secure, efficient and compliant organization.